Doesn't this picture just look sinful? This cake was entered into our local county fair's apple cake contest. I entered this but did not place. I have to admit I was a little disappointed but that is OK. This cake is a winner for sure. There was a lot of competition and let's face it, we live in a small town. It doesn't bother me though, I would rather win a contest rightfully than to win because someone knew who I was. There is just something about a pound cake. Looks so heavenly in the pan. I used to have the hardest time with the cake sticking to the pan. It would drive me crazy to have such a pretty cake turn out in pieces. My tip to get your cake to slide out perfectly is to apply a coat of shortening on every nook and cranny of the pan and then dust with flour all over. 99% of the time, it slides right out. It is just too pretty to leave half of it in the pan! Just the smell of this cake baking screams fall. The caramel glaze just sends this over the top. The perfect companion to my morning cup of coffee. Scrumptious fall inspired pound cake studded with apples and spices and smothered in a glorious caramel glaze. Heat oven to 350°F. Grease and flour 12-cup fluted tube cakepan. In large bowl, beat granulated sugar, oil, vanilla and eggs with electric mixer on medium speed until light and fluffy. Beat in flour, salt and baking soda, apple pie spice until smooth. Stir in apples. Pour into pan. Follow Served Up With Love (Melissa)'s board Fall Favorites on Pinterest. Such wonderful and delicious looking cake! This cakes looks amazing! Enjoy your weekend! This looks absolutely delish!! 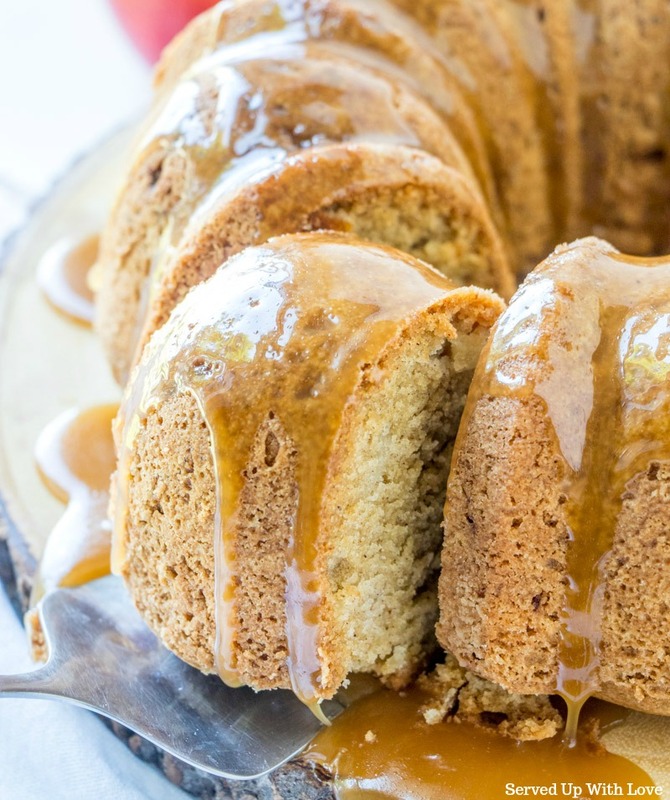 I'm loving all the fall recipes I'm seeing now, and this is one of my favorites! This looks so good... 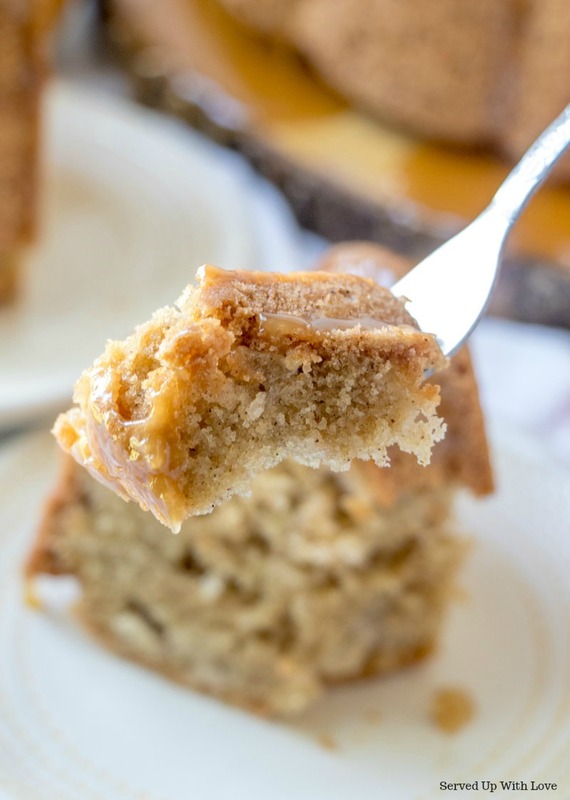 I am drooling love caramel, so this is a perfect cake for me. Thanks for sharing on Foodie Friends Friday. Looks delicious!!! Love the caramel sauce dripping down the side!! Glorious. 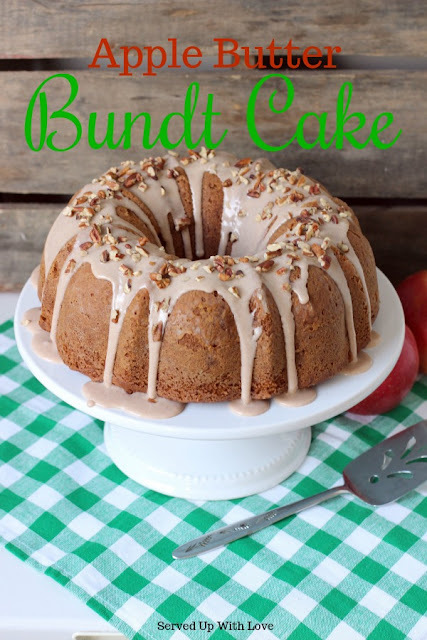 As soon as I buy a bundt pan, I MUST make this!! Thank you for sharing it! I made your pound cake this weekend and it was delicious! I did have a bit of a problem with it that was totally my fault. I blogged about it today! I would give this cake a Blue Ribbon! Apples and Caramel together are a perfect fall combination. You're caramel glaze has me wanting to lick my computer screen. I'm featuring this at tomorrow's Thursday's Treasures. Thanks for sharing. Pinned. CONGRATULATIONS!!! Your recipe has been chosen to be on Today's Feature Post from Cast Party Wednesday #56! The carmel glaze really puts this over the top. I would love it if you shared this on foodie friday today. 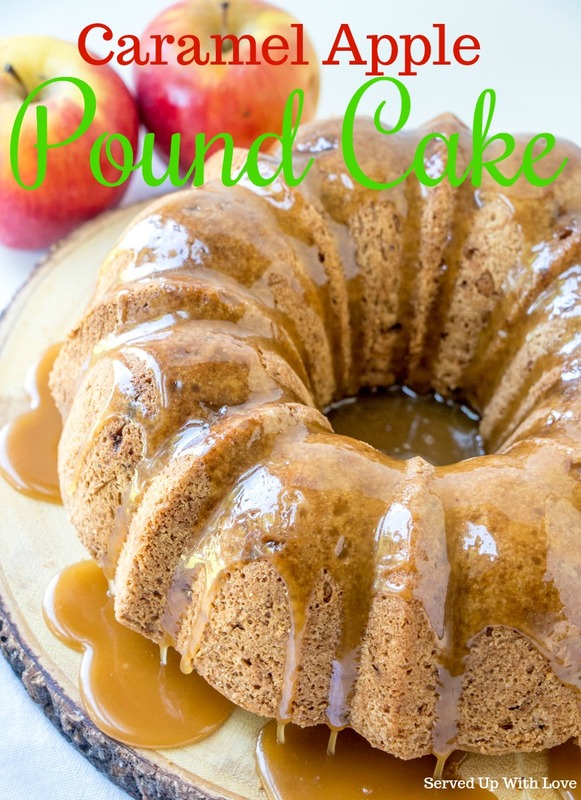 I have never had an apple pound cake and can't wait to try this recipe. Looks yummy. 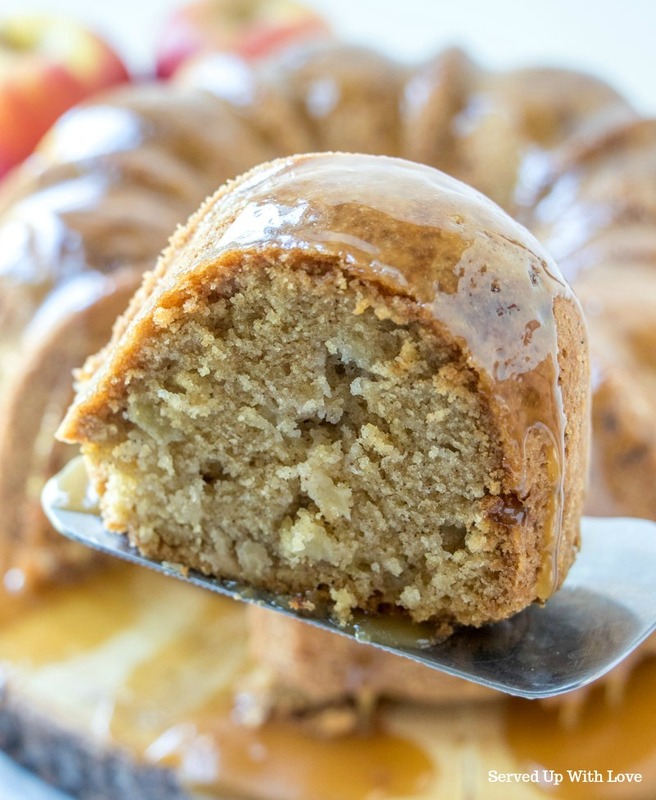 Could you tell me what kind of apples you used for this delicious looking cake? Thanks so much! Bunny, I used granny smith apples but I am sure any good cooking apple will do just fine, hope you get to try it. It is some kind of good! Thanks for stopping by! Thanks for the reply. 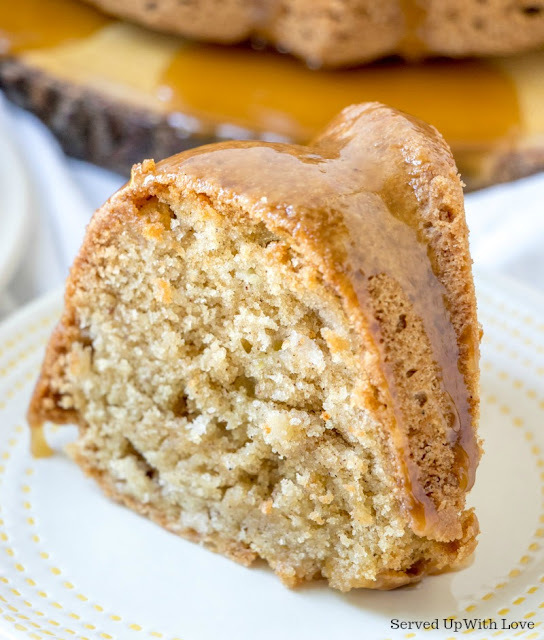 I'm making the list now and plan on baking it this afternoon - sounds so yummy! That looks amazing!! Newest follower...found you on Mom On Timeout. How could this not place? I'd give it a ribbon for the glaze alone. Thank you for linking with See Ya In the Gumbo this week. Chocolate covered caramel entails a simple activity that the entire family can do together. Note that recipes are many too. This cake looks fabulous. I love caramel. I chose it as my host favorite this week on Foodie Friends Friday, so it will be featured Monday on Daily Dish Magazine. 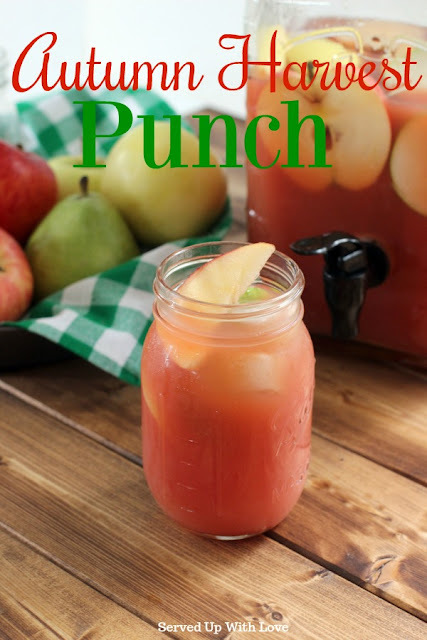 Having repinned this from someone on Pinterest, I decided to try it today, and take to our weekly church potluck tonight. I didn't have any apple pie spice on hand, but I found a recipe to make my own using cinnamon, nutmeg, allspice, & cardamom. I was out of cardamom, so I ommitted it. The cake was delicious, and the glaze really put it over the top. I had a little trouble keeping the glaze on the cake plate (needed a larger plate! ), so I think the next time I make it, and there will be a next time, I will try it in a 9 x 13 pan, and maybe even double the glaze recipe. Only about a thousand calories, I know, lol! Renna, I am so glad you tried the pound cake, it is out of this world. I agree the glaze takes this over the top. This cake would be no matter how you make it. So glad you stopped by to let me know how it worked out for you. I have not made it yet this fall but plan to really soon. Oh this caramel glaze has me drooling. This cake is being added to my "must try" list for sure but something tells me I might eat the whole thing by myself! Thanks so much for posting this! That is awesome Rachel. This one is for sure a family favorite. I have been thinking about this one for the last couple of weeks. I think it is going to be baked here pretty soon. Hoping you make this one for many years to come. This cake was great! My kids are not big on cakes and they loved them! Thanks for the recipe. Just fabulous with that enticing caramel dripping on the sides! Thank you for sharing!! 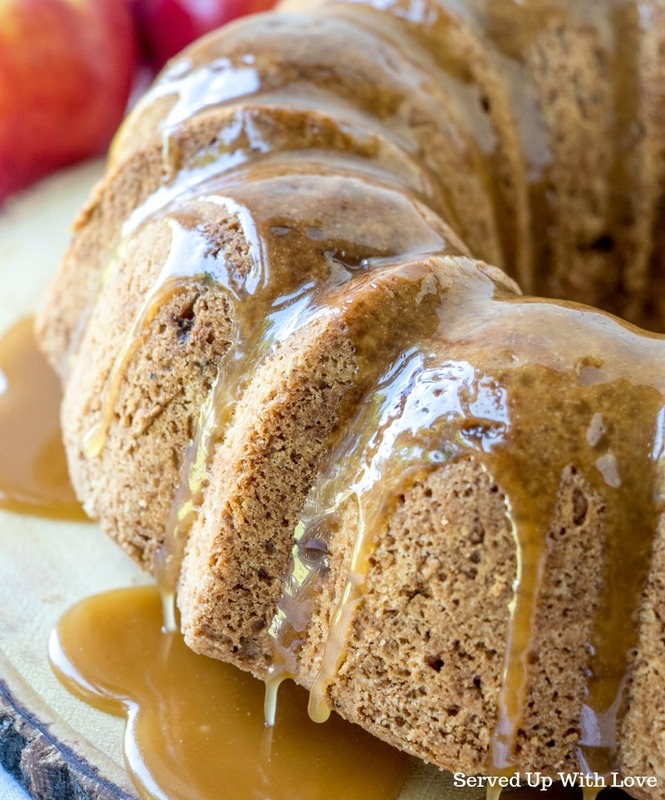 Looks amazing with that dripping caramel sauce on the sides! 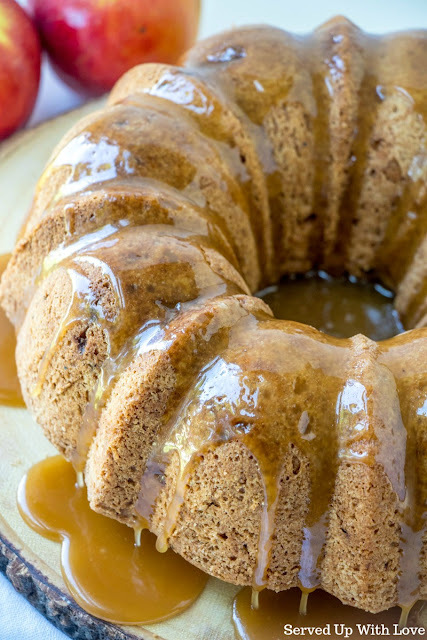 That caramel glaze looks amazing! I can't wait to try this cake during apple season!